Your food truck is mobile, your customers are mobile, and your most powerful marketing edge is mobile technology. With your own mobile app, you are placing your food truck services right in your customer’s handbag or pocket, ready to provide the information they are seeking. This creates a direct line of communication to your customers. Your customers will love being able to browse your menus, map directly to your current location, make an order online, receive digital coupons, stamp their rewards card, request catering for their events, or just simply contact you at the tap of a button. Explore The Tempted Palate progressive web app (PWA) navigation and features on the right. To explore The Tempted Palate progressive web app (PWA) navigation and features, tap the image below. Learn more about our mobile features that can be used within your app. Easily display your food truck schedule and venue locations. The schedule calendar can include venue information, dates, hours, map navigation, call button, photos, videos, web links, and more. Showcase your unique menus from within your mobile app. List an unlimited number of products and categories including special dietary menus. Each product listing can include images, descriptions, price, embedded video, and other attributes. Secure online ordering to your Clover POS system. Customers order and tip through your mobile app. You receive the order, payment, and confirmation to your Clover POS. The customer gets to skip the line and pick up the order at the window! Step-by-Step instant navigation straight to your food truck. Map locations can include venue information, call button, photos, videos, web links, and more. Do you cater private events? Can your customers request your food truck come to their location? If so, give your customers the ability to easily send you requests for their next party or special event all from within your app. Reward customers and increase repeat visits. Customers can earn points for purchases, visiting your location, or sharing your business on social media. Determine the number of points and the reward gift. Digital coupons can increase visits and sales. Delivering discount coupons to your clients has never been easier. Users can save coupons or redeem them immediately. You can also create coupons redeemable at specific food truck locations. Reward your loyal customer with VIP perks. You can choose to give exclusive benefits to your customers that earn the most rewards card points. Choose from three different levels of perks to suit your business services. Keep in touch with your customers, by sending messages directly to them. The most powerful customer engagement tool available. Send special offers, announcements, event information and more to your customers, instantly using Push Notifications. Users open almost 97% of push notifications, while the open rate of email campaigns are 10-15%. Send automated messages to your app users when they enter, remain, or leave specific areas. Create a virtual fence around your food truck’s location and notify customers of specials when they are nearby. SMS Notifications, also known as “text messages”, can be sent to your customers’ smartphones. Send your customers a text message reminder about your food truck schedule, their next catering event, or your next special event. 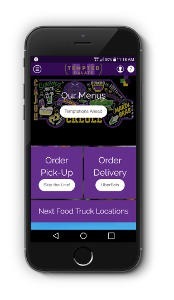 Your mobile app is custom built to match your food truck branding. We provide countless design options and work closely with you to ensure your mobile app is an extension of your brand. Showcase your best reviews within the app to attract new customers. Increase your positive reviews and social media shares from your recent customers through your mobile app. Connect your social media pages to promote sharing of your app and food truck information. Include popular social media pages, such as: Facebook, Twitter, Google+, Instagram, and more. Integrate your Yelp and TripAdvisor pages to attract even more rave reviews. Your mobile app is your digital business card and so much more. Your customers can contact you from within your mobile app without having to remember your number, email, or even your address. Action buttons enable one-touch calls, email, or even launch your main website. You have the freedom to make unlimited updates to your mobile app. Keep it refreshingly current, vibrant, and engaging. Many changes can be immediately available and do not require an app update. We can also manage updates and customer messaging while you focus entirely on your food truck. Ask us about our Concierge Service! We add SSL Encryption to your app. This means your customers’ login information, credit card and other data is encrypted and protected. Ready to Get Started on Your Mobile App? Request a free consultation to receive more information and an estimate.